Item #33383 : Original era manufacture. 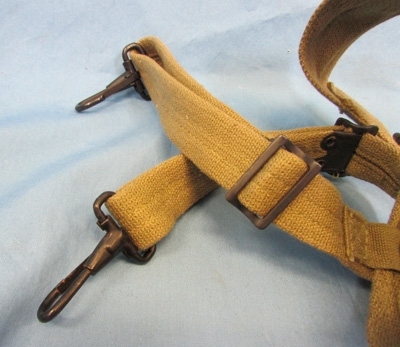 Light OD canvas suspenders with darkened brass buckles and darkened steel hooks. Near new condition and likely never worn. We have several pair in stock, all are maker marked, showing a variety of manufacturers.Most show only storage wear, of minor staining to the canvas, and very light surface corrosion to the metal fittings. Again, very minor issues.